The rampant world champions wowed enthralled fans on Saturday at Japan's 2019 World Cup final fortress, producing some breathtaking rugby to complete a 3-0 Bledisloe Cup series wipe-out. The Wallabies were anything but disgraced, mounting a spirited mid-match fightback to briefly raise hopes of an upset, but were ultimately outdone in the razzle-dazzle department. 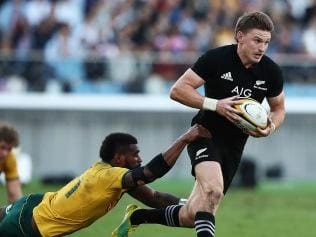 The record crowd of 46,143 - the biggest for a rugby Test in Japan - loved Ben Smith's first-half tunnel ball to Rieko Ioane but, not for the first time, it was a breathtaking Beauden Barrett try that broke Australian hearts just before the hour mark. The 14-point buffer was the killer blow before opposing hookers Tolu Latu and Joe Moody provided a flash point at Nissan Stadium. Wallabies replacement rake Latu copped the bum deal, yellow-carded for lashing back at Moody moments before the All Blacks cashed in on their one-man advantage with a runaway try to Smith. The loss was the the Wallabies' seventh in 10 starts this year and not the opening to a four-Test spring tour under-fire coach Michael Cheika had been hoping for. The men in gold made a confident enough start, piling on the pressure with some brilliant attack and having Dane Haylett-Petty denied a second-minute try after being forced into touch as he attempted to ground the ball. 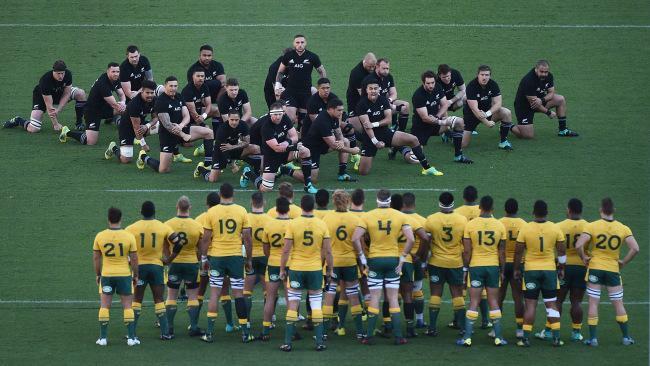 Typically, though, the All Blacks countered to open the scoring 12 minutes in through a converted try from flanker Liam Squire, who brushed off Kurtley Beale much too easily for Australian fans' liking. Beale and Barrett traded penalty goals before an even softer try from Keiran Read from the scrum base stretched New Zealand's lead to 17-3. Sefa Naivalu gave the Wallabies hope when he jinked and muscled his way over in the corner for a crucial strike barely a minute before halftime to pull Cheika's underdogs to within seven points. A rampaging Rob Simmons, fired up by Cheika's pre-match rev-up, was held up over the line moments after half-time, but provided enough force to induce a penalty goal for Bernard Foley as the Wallabies threatened a boilover. 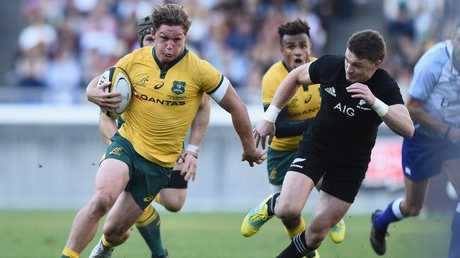 But another Barrett penalty followed by Smith's 30-metre effort clinched New Zealand's ninth win from 10 starts during Cheika's reign. A late Israel Folau try was mere consolation before man-of-the-match Ioane completed the scoring with the All Blacks' fifth five-pointer three minutes before full-time. Get every game of the 2018 Mitsubishi Estate Rugby Championship LIVE into your living room. SIGN UP TODAY!